We are here solving problems based on the concept called work, power and energy. Power is the ability of a system to do some work in a given time. If work is done in small time, power is more and vice versa. We shall know that in each case work done is same but how quick the system in doing the work is measured with the term power. Some times all the applied energy is not able to be productive and do the work and it is measured with efficiency. It is the measure of how productive our given energy is in doing the work that need to be done. 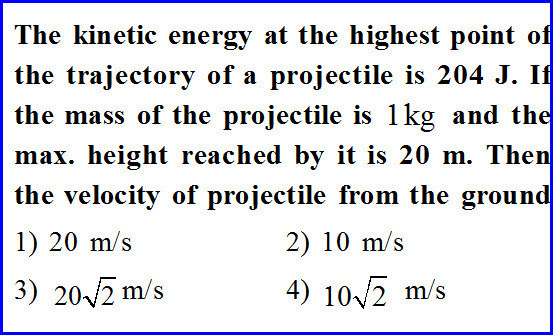 It is given in the problem that the kinetic energy of a body at its highest point of the projectile is 204 joule. 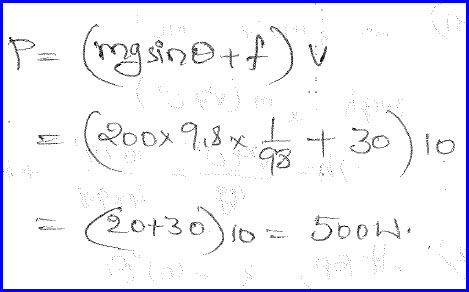 If the mass of the projectile is one kilogram and it can reach a maximum height on it is 20 meter. We need to measure the velocity of the projectile at the time of projection. We know that at the maximum height of the projectile, it has only horizontal component of the velocity and its vertical component of velocity at that instant is zero. 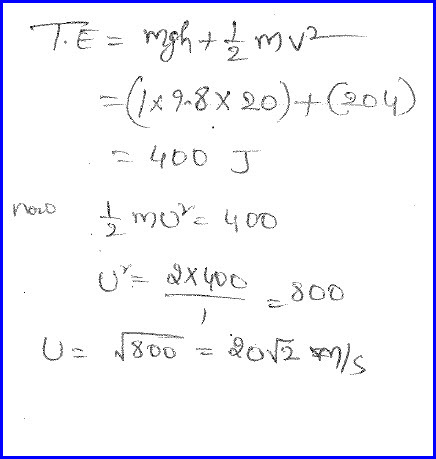 Thus the velocity of the projectile at the maximum height is minimum and hence its kinetic energy is minimum. At the maximum height the body has both potential energy and hence we can measure the total energy as shown in the diagram below. At the point of projection it has no potential energy and hence we can equate the total energy to the previous case and solve the problem as shown in the diagram below. A scooterist together with his vehicle is weighing 200 kilo gram and he is climbing a hill of known inclination with a velocity 10 meter per second. If the frictional force against the motion is 30 newton, we need to measure the power exerted by the engine. We know that the power is defined as rate of change of work done. 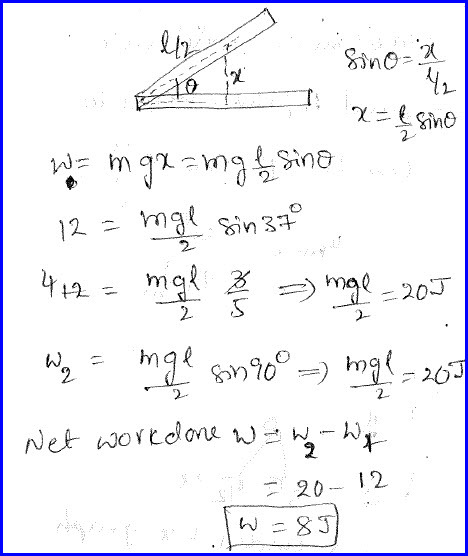 Work done can further defined as the dot product of force and displacement. As displacement by time is velocity, power can also be defined as the dot product of force and velocity. 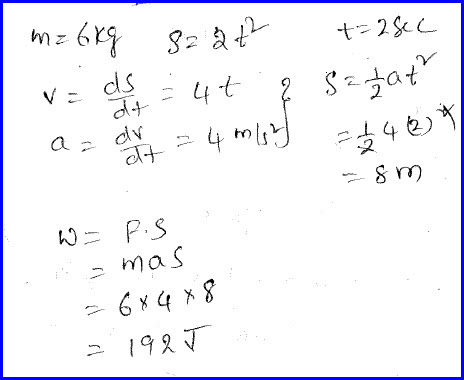 Here weight of the body can be resolved into components and SIN component acts against the motion. Even the friction also acts against the motion. Thus the total force is the sum of the two forces. We can solve the problem as shown below. If work done in raising one end of uniform rod from its horizontal position to a particular position, we need measure the work done in getting it to the vertical position. The problem is as shown in the diagram below. When the horizontal rod is lifted to a particular position, its center of mass is raised to a particular height from the reference point and it can be measured as shown in the diagram below. When it is taken to the vertical position, its center of mass is at its middle and it is at a height equal to half of its total height from the same reference point. The problem is as shown in the diagram below. 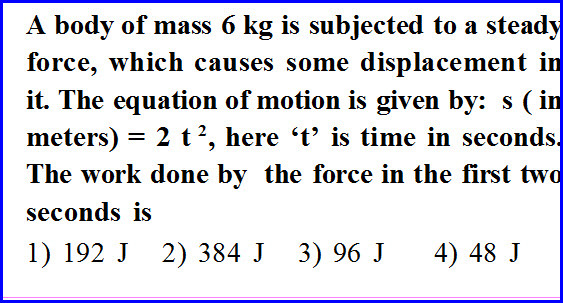 A body of mass 6 kilogram is subjected to a steady force which causes some displacement in it and it is expressed in terms of a mathematical equation. We need to know the work done by this force in the first seconds. The problem is as shown in the diagram below. 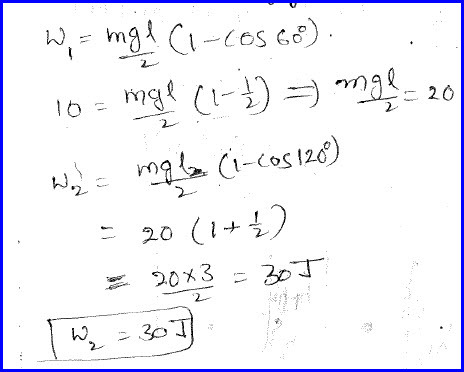 Displacement is given in the problem and rate of change of displacement is velocity. We also know that rate of change of velocity is acceleration. We can measure acceleration that way and by substituting it the definition of work done ,we can solve the problem as shown in the diagram below. A rod is suspended vertically from a rigid support and it to turn by known angle, work done is as shown below.We need to measure the work done in turning it further by some more angle. The problem is as shown in the diagram below. We know that the for a body like rod whose mass is uniformly distributed and we shall consider a point where its mass is concentrated at its center. And we shall consider that point as a reference point. By further solving the problem as shown in the diagram below.